One Plus has finally and officially launched the Oneplus One with vigorous specifications. The Plus One is priced at $299 ( RS 18300 in India ). The handset has much better specs than Samsung Galaxy S5. It will Compete ( Rival / VS ) with HTC one M8, Gionee Elife E7 and Sony Xperia Ultra. The Oneplus One has 5.5 inch FHD 1920 x 1080p Display with Corning Gorilla Glass 3 Protection on the TOP. It runs on Latest Android 4.4 Kitkat Operating system with Cyanogen MOD 11S ROM. It would be available in Austria, Belgium, Denmark, Finland, France, Germany, Hong Kong, Italy, Netherlands, Portugal, Spain, Sweden, Taiwan, United Kingdom, and the United States (USA) . 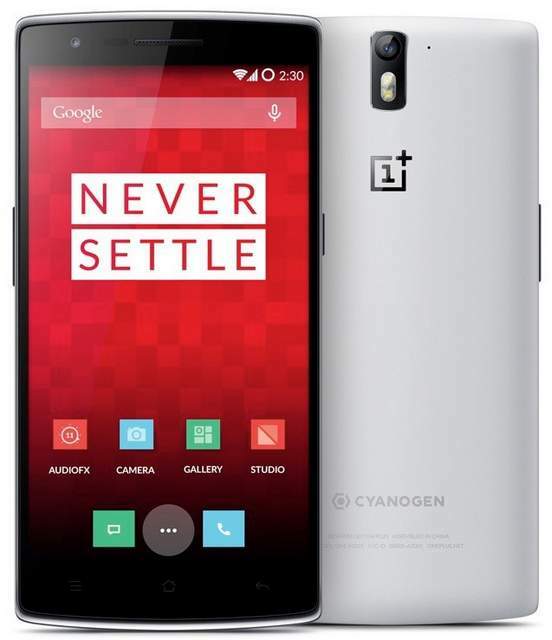 The Oneplus one gains the strength from 2.5GHz quad core CPU based on Snapdragon 801 Chipset. It packs with 13MP primary shooter and a 5-megapixel secondary shooter. It has3 gigs of RAM and 16 GB / 64GB of Internal storage. It offers 4G LTE / 3G, WiFi ac, WiFi direct, Bluetooth 4.1, GPS, USB OTG and NFC connectivity options. To make the handset alive there is 3100 mAh battery, which seem to be good and should give good talk time. The OnePlus One is priced at $299 for 16GB variant and $349 for 64GB version. It comes in Black and White colors.